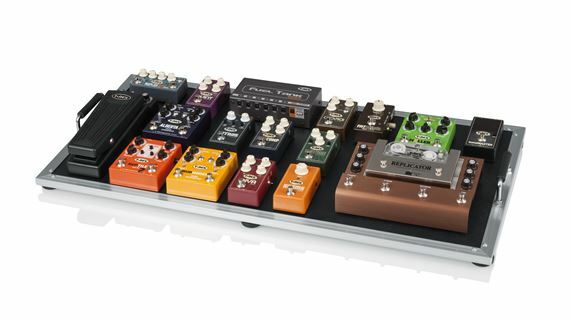 Order your Gator G-TOUR PEDALBOARD-XL Extra Large Pedalboard with Wheels from AMS and enjoy 0% Interest Payment Plans, Free Shipping, Free Extended Warranty & 45 Day Money Back Guarantee. 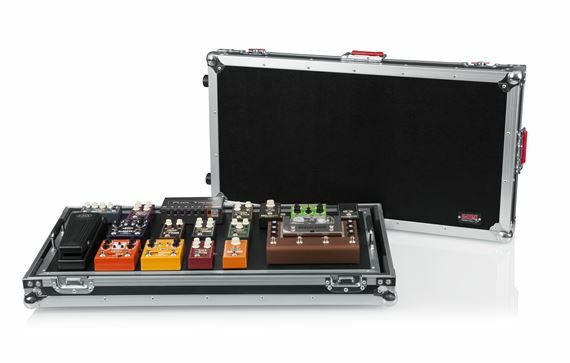 For the ultimate protection for your pro-line pedalboard collection, choose the G-TOUR PEDALBOARD-XLGW case from Gator Cases. Built from durable plywood and aluminum reinforcement at the corners and joints, this extra large pedalboard case from Gator Cases is made to resist impact, dust and water. Your pedalboards can neatly rest in fitted pro-grade EVA foam padding, protecting them from jostling and shock during transit. Comfort-grip handles allow you to easily remove the pedalboard platform from the case. Removable pedal board surface 34" x 17"
Exactly what i need. Solid and well built. I got it and honestly that case is huge, it does have wheels but not very portable, in the other hand the actual pedal board itself is good size. Surprisingly better than I expected. More versatile and by far studied than it’s competitors. I thought it would be too large of a board but it turned out just right. Besides using it on the floor as a standard pedal board, it works great on a keyboard stand as I like to be able to tweak and adjust the controls. Of course I move the wah and volume pedal to the floor. It is built much stronger than my past boards. It is worth the price and exceeded my expectations. Perfect for my needs! Happy customer! Built great and heavy-duty without being too heavy to move. Works great for my set-up. I have owned many Gator cases and they have never let me down. This is a tank I like that it's super heavy duty and designed so that my pedals always stay right where I like them. I usually leave the bottom of the case and just take the top off but in tight spaces the board conveniently lifts out and takes up less space. I use this with my pedal power, dunlop bass wah, chorus, and orange detonator and they all fit nicely and with the supplied strips stay exactly where I put them. The two wheels on the bottom of the case are great and make this so easy to transport. Really awesome pedal board and AMS was prompt in shipping and customer service. Highly recommend.